Five students go to detention. Only four leave alive. For fans of Gossip Girl and Pretty Little Liars, this is the perfect high school thriller. Yale hopeful Bronwyn has never publicly broken a rule. Sports star Cooper only knows what he's doing in the baseball diamond. Bad body Nate is one misstep away from a life of crime. Prom queen Addy is holding together the cracks in her perfect life. And outsider Simon, creator of the notorious gossip app at Bayview High, won't ever talk about any of them again. He dies 24 hours before he could post their deepest secrets online. Investigators conclude it's no accident. All of them are suspects. Everyone has secrets, right? What really matters is how far you'll go to protect them. Make sure you check out Karen McManus' post on multiple narrators over on our blog. 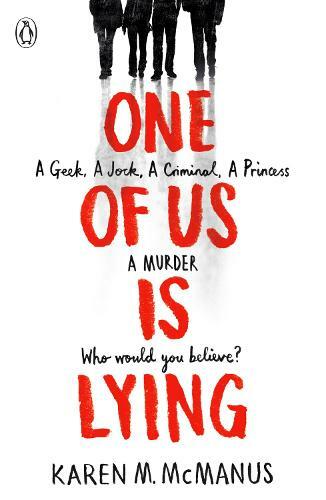 This book promises Pretty Little Liars meets The Breakfast Club. The book promises a murder, and four guilty looking teens. The books promises suspense, thrills and plot twists.